It’s magic when two people fall in love. The spell continues when the two decide to begin a life together in holy matrimony. What is not always magical is what follows – the actual wedding ceremony. They can be where the bride and groom begin to lose people who become bored of the same old kinds of wedding entertainment. 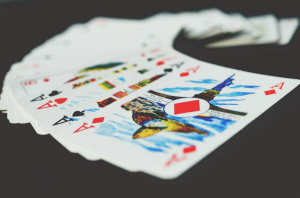 To help you avoid the post ceremony doldrums when it comes to entertainment, I thought I’d put together a quick list of five reasons why hiring a close up magician for your special day is an awesome idea. 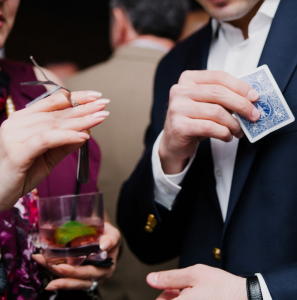 Your guests will quit being an audience and become participants: There is nothing that excites a close-up magician for wedding celebrations more than an actively participating audience. In fact, my kind of magic requires the audience to become invested in what I am doing. A close-up magician can help you to avoid those awkward silences: Wedding celebrations tend to have many awkward moments in which the guests simply sit and stare uncomfortably at each other. A good close-up magician can go from table to table encouraging guests to participate in his/her act and at the same time he/she can encourage guests to interact with each other. This can inject into a dying celebration new life and energy. Moreover, the feats of magic that I perform will have guests talking to each other who might otherwise remain silent. Close-up magicians are versatile: Unlike scheduling a band, for example, you don’t have to worry about whether or not a magician will be able to adapt to one kind of celebration verses another. Whether the wedding celebration you hold is traditional or unorthodox, magicians have an uncanny ability to adapt to the situation. Scheduling a magician for your wedding celebration is unique: Many people have not seen a close-up magic act where as many have seen bands and other kinds of wedding entertainment. This will add to the memorable quality of your special event. Magicians create moments that go well in pictures: It can be quite challenging for wedding photographers to captures post ceremony moments that are exciting and fun. After pictures of the bride and groom embracing, kissing or cutting the wedding cake have been taken what else is there? Magicians create moments of pure excitement, joy, laughter and anticipation that are all worthy of being immortalized in photos. Of course, all of these reasons to hire a close-up magician for your wedding reception are only as good as the magician you hire. There are many close up magicians in NYC and unfortunately – just like in any industry – not all of them are good. On the other hand, I have the experience and skills to entertain and fascinate your guests. So contact me, ask for references and see what I can do to help make your wedding reception as memorable as the actual ceremony is sure to be.